Soon, we can measure the bounce that the two tickets have received from their gatherings. But the more important question is whether the conventions establish arguments that are sustainable -- over the course of the campaign and, for the winning ticket, over four years of governance. Four years ago, John Kerry's convention produced a narrative that proved unsustainable. George W. Bush's convention produced one that was sustainable until Katrina and the 2005-06 meltdown in Iraq -- yet that may be redeemed in history by the success of the surge and the rapid response to Gustav. 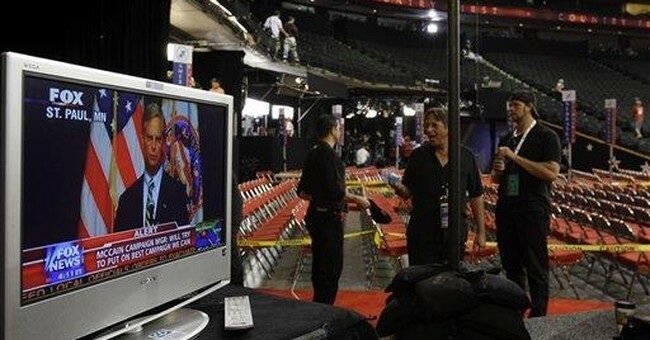 One of the themes hammered home at Barack Obama's convention was McCain equals Bush. That never struck me as sustainable and was pretty well demolished on the first full day of McCain's convention. Neither Obama nor McCain is a generic candidate -- they are distinctive individuals, to whose specific characteristics voters respond, positively or negatively. The Republican convention's premise is that McCain is the maverick reformer -- an American version of Nicolas Sarkozy, who replaced an unpopular president of his own party. There is plenty in McCain's record to back that up. Not least is his selection of Sarah Palin for vice president. Palin's record of successfully battling establishment Republicans and oil companies in Alaska clearly appealed to McCain. And that was amplified by the mainstream media attacks on her. Now the media, which were not alarmed by Obama's thin record, is worried about Palin being a heartbeat away from the presidency. Other women who were stay-at-home moms for years and then emerged into public life have outperformed their resumes -- namely, Katharine Graham, Jeane Kirkpatrick, Madeleine Albright, Nancy Pelosi and Geraldine Ferraro. Palin, who has negotiated a natural gas pipeline with the oil companies and Canadian federal, provincial and Inuit authorities, may do so, too. We'll see if that argument is sustainable. Voters express great dissatisfaction with the economy, even though it grew 3.3 percent in the last quarter. The Obama convention contended that the Democratic nominees understood people's woes from personal experience and that their programs would provide economic security. But the substance of those programs -- refundable tax credits (i.e., payments to those who pay no income tax) and a national health insurance option -- are unfamiliar to voters, and their details can be hard to explain. The McCain convention's thesis is that higher taxes on high earners in a time of slow growth will squelch the economy (this was Herbert Hoover's policy, after all). These assertions, too, are unfamiliar to voters. And, up to this point in the campaign, neither party has set out its programs clearly (or characterized the other side's fairly). During the course of the year, two issues have unexpectedly turned in favor of the Republicans. One is Iraq: It is becoming plain that the surge has succeeded, and victory is in sight. McCain can argue he was right; Obama can argue it is safe to leave, as he has long urged. But the issue has lost much of its salience. The other issue is energy. Four-dollar-a-gallon gas has produced majorities for offshore drilling, which McCain now favors and Palin always has, and which Obama and Joe Biden still dismiss as insignificant. Despite the recent drop in gas prices, the Republican position looks more sustainable to me, likely to trump the Democrats' quasi-religious fervor for renewable energy sources. Al Gore's speech was well received in Denver, but voters are not prepared to accept the sharp economic sacrifices he demands. This election cycle has been full of surprises and unpredicted turns. Both candidates' vice presidential choices tended to undercut, at least marginally, their basic themes of change and experience. The political fundamentals -- an unpopular president, a sluggish economy, an unpopular war -- still favor the Democrats. But my sense is that the Democratic meme is less sustainable than the Republican' appeal. Which leaves things roughly tied.